Artiko has created the Tiramisu of Dreams. Even frozen, this treat tastes delicious. Left in the refrigerator for a few hours to thaw, the Mascarpone becomes creamy, smooth and fluffy. The delicate coating of cocoa on the top accentuates the espresso drenched lady fingers, a sponge-like cake. stealing a bit here and there and had this for dessert more than once all while feeling completely spoilt. Thank you to Mary for her review. She convinced me to buy this in about 5 seconds. The Indian Mini Samosas are also delicious and gourmet. Artiko seems to specialize in foods that are easy to cook or thaw, taste like gourmet treats and allow you more time to enjoy life without having to wash any dishes. Since I never wanted to use raw eggs, I never made Tiramisù. That was until I decided to substitute bananas for the raw eggs. Mascarpone is the secret ingredient in Tiramisù. It has an ivory color and will soon seduce you with a delicate perfume. I find it to be perfect with bananas and rum. This is now my favorite dessert. Tiramisù (tih-ruh-mee-soo) is Italian for "pick me up." This dish does give you a bit of a heady feeling! It is truly heavenly in any form. Usually it contains very strong coffee. Since not everyone has an espresso machine, I used coffee granules, which work quite well. Lady Fingers are essential and lately I prefer the softer version in place of the dry cookies, which also come in a 7-ounce package. 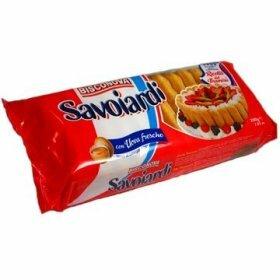 The packaged cookies are a product of Italy. We prefer not to over soak the cookies. You may wish to double the coffee liquid for the dry cookies. Sometimes I just use cocoa powder and omit all the other chocolate ingredients. of your local grocery store or you can call 1-800-755-9890 for more information. The ones by Specialty Bakers, Inc. are the best ones I have tasted. 1/2 cup mashed banana (1 medium banana) Cannot be over ripe! Will make cheese look curdled. 1 tablespoon meringue powder (select ingredients, click M, then #82260 is the item number. Chefmaster is the brand. )This is what I use in place of the eggs. 1. Place the the Lady Fingers in a square baking dish. and rum extract. Stir until the sugar has completely dissolved. Sprinkle this mixture over the Lady Fingers. Leave to soak. banana flavoring, vanilla, confectioners’ sugar and meringue powder. Beat the mixture until thickened and creamy or about 1 minute. Beat one more minute until light and fluffy. and snip off one of the corners when ready to use. filling. You could also substitute grated semisweet chocolate. grated white chocolate. Refrigerate 1/2 an hour to an hour. in stripes across the tiramisu. This is heavenly! Hint: You can double the recipe sponge cake if you prefer. the edges with Amaretti: small round cookies with an almond flavor. Serves 2 when using fresh cookies, or 4 when using dry cookies. How are Lady Fingers made? 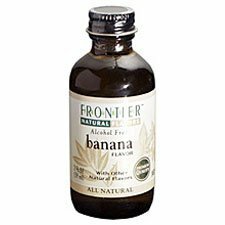 This banana flavoring can be used to enhance any desert or drink where the flavor of banana will be emphasized. This will enhance the flavor of bananas in banana bread and is also delicious when added to fruit shakes. You can mix it into chocolate sauces or add a few drops to pancakes. The latest way I've been using this is in fruit smoothies. You can put an orange, apple and banana in a blender and add just enough orange juice to make two smoothies. Then add in vanilla, this banana flavoring and your choice of sweetener. Stevia works well, but a floral honey will also add new dimensions of flavor. Blend this with a tablespoon of Soy protein powder and you have a delicious shake. Add in some ice cream and you have something even creamier. Add in some vitamin powder, like the All-One powders and you have a healthy, nutritious, energy shake. Freezing some of the fruit before making the shake helps to keep the shake fresh and cold without the need for ice. This shake idea is also delicious with kiwi, mango and pineapple. I first started using this to enhance a banana tiramisu and now use it mostly in smoothies and baked items like banana bread.